I have thought about building this Shaker music stand from Thos. Moser’s measured drawing in “How to Build Shaker Furniture” for a while. The final push I needed came from viewing Purplelady’s wonderful build here. She was kind enough to provide me with some great advice from her build experience. Most of the stand is built from the same cherry lumber that I used for these cabinets. The history of the cherry is given in the description of that project. The spindles and pins are turned from a pear tree that came down in front of our house during an ice storm in 2008. Luckily, the tree just brushed the front of our house as it fell. 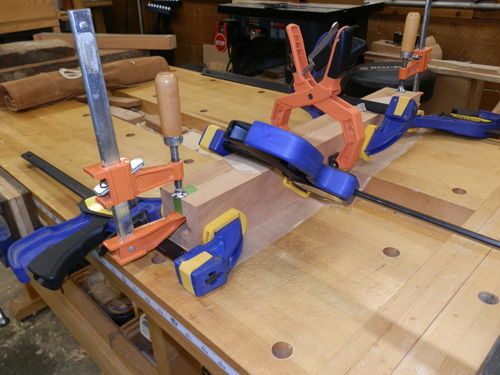 I formed the square slot through the pedestal using a dado set on the two halves and then glued them together. 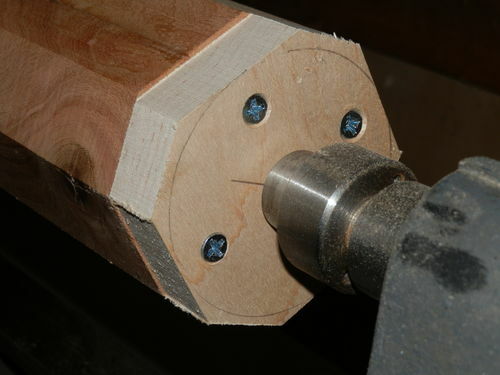 In order to mount the hollow pedestal blank on the lathe, I left it a bit long and screwed some end pieces on. If I built another one, I would not bother with the piece on the bottom. Later in the process, I decided to glue a short piece that I cut off the square shaft into the bottom of the slot for added strength. 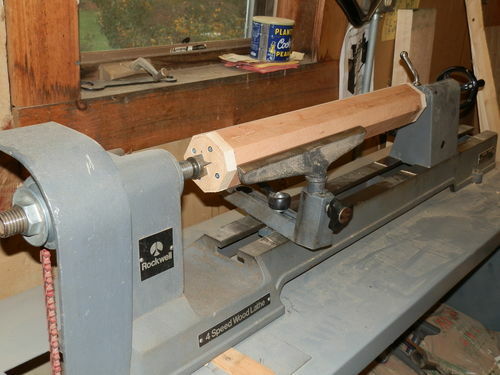 I would do this earlier and it would provide support for the lathe center. 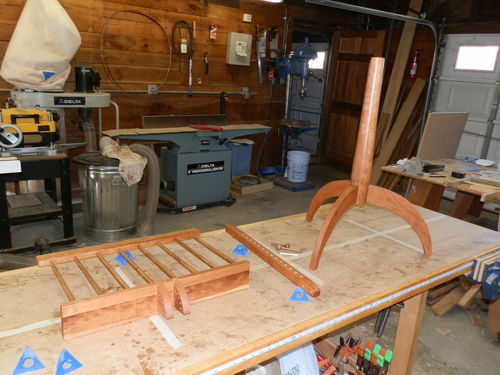 These are the pieces after applying the Danish Oil finish and before the final assembly. Great job! What’s your instrument? That turned out beautifully! Thanks for sharing the pictures of the build. That stand looks great in your room. It looks like it always belonged there. I like the pegs! Ron – I play the guitar. But, at this point I hesitate to call it “my instrument”, since that seems to indicate some level of mastery. I tried playing many years ago and them stopped. Having recently retired, I am twanging again. Now I have more time and access to all the great stuff available on the internet, so there is some hope. Thanks for the reply. Don’t cut yourself short, if your musicianship mirrors your woodworking talent, we’ll be seeing you at Carnegie Hall! That is a Very COOL music stand… very flexible, etc. Really beautiful stand! Is the main body of the base pear wood also? Or is that cherry? It’s hard to tell from the pictures. I recently had the pleasure of working with some pear wood from a tree on my father in law’s land. It of the (admittedly limited number of) woods I have worked with is my favorite! Very hard, fine grained, beautiful coloration. I made a few spoons from a branch, and I am kind of obsessed with them. The grain of the pear wood doesn’t raise at all with wetting, so it was great for cooking spoons. Really beautiful stand! Is the main body of the base pear wood also? Or is that cherry? It s hard to tell from the pictures. I recently had the pleasure of working with some pear wood from a tree on my father in law s land. It of the (admittedly limited number of) woods I have worked with is my favorite! Very hard, fine grained, beautiful coloration. I made a few spoons from a branch, and I am kind of obsessed with them. The grain of the pear wood doesn t raise at all with wetting, so it was great for cooking spoons. Thank you. 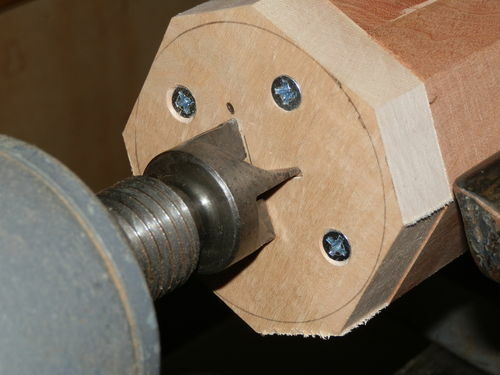 The only parts that are pear are the eight spindles on the top and the two adjustment pegs – one for the height and the other for the tilt.